Sounds will be a long journey to go? Well, to get you excited, you will get different awesome rewards for each quest you completed. So, let’s start with the first sub-quest, Signal Strength. 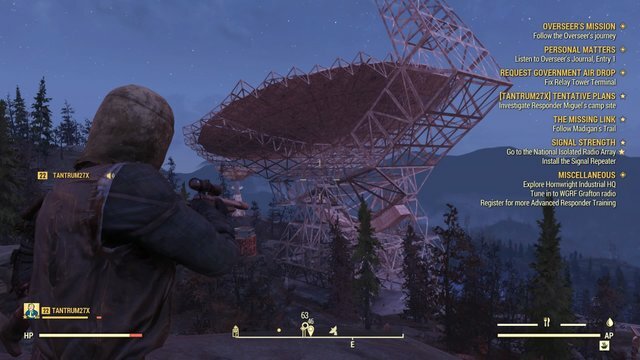 In this sub-quest, you will have to earn the trust from the character Rose, in order to collect signal repeaters to boost the signal, and strengthening the Top of the World’s Radio Signal. And here are the steps you need to follow to complete the Signal Strength quest. The first thing you need to do is find the Signal Repeater Schematic. To gain Rose’s trust you need to help her expand her radio broadcast’s range, you can do it by crafting a Signal Repeater and install it in the radio array. Begin by heading toward the Seneca Rocks Visitor Center which located at the northeast of Top of the World. Once you reached, head to the backside of the building and do battle with the small army of Scorched located there. 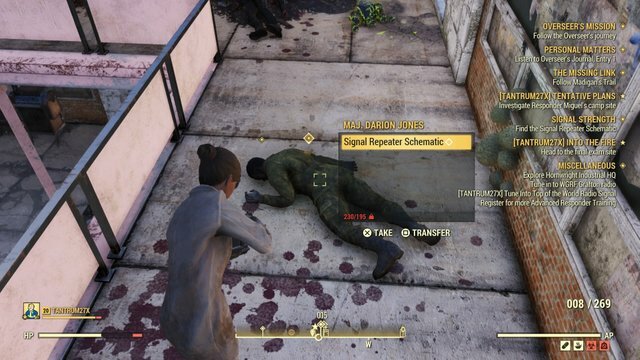 Head up to the second floor where you will find the body of Major Darion Jones, and loot him to get the Signal Repeater Schematic. 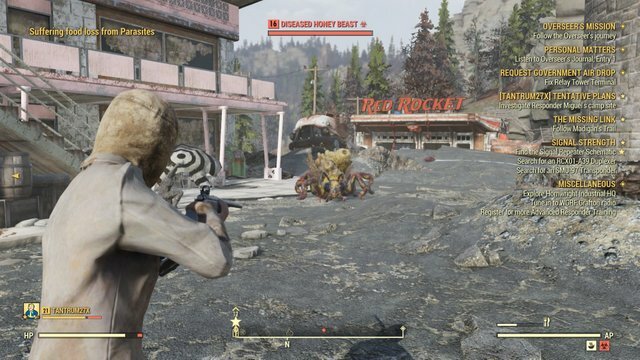 There is also a chance that a Diseased Honey Beast will spawn near the Red Rocket next to the visitor center, you can kill it for some extra loot before you leave. Now you have to find two special materials, one RCX01-A39 Duplexer and one SMU-97 Transponder to craft the Signal Repeater. To get the Duplexer, follow the train tracks south of Top of the World to reach a train crash location called 98 NAR Regional. 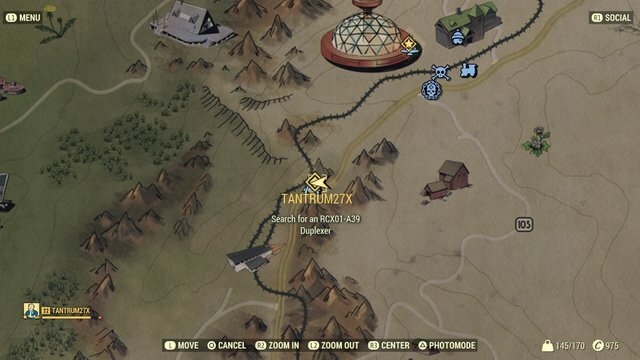 Reach the train crash site with following the quest marker toward an overturned red train car with some machinery. You find a few Mr. Gutsys around the wreck site, so take them out before looting the trains. 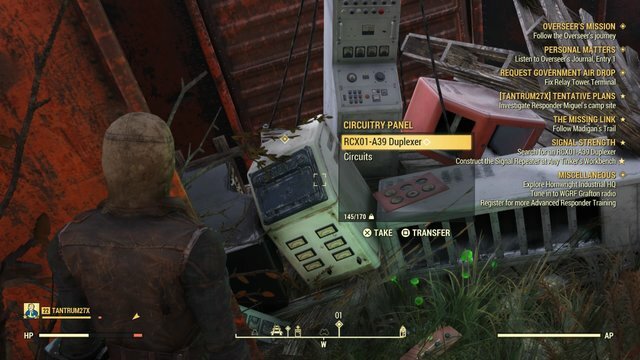 Find the quest marked circuitry panel and loot the Duplexer. For the Transponder, head southeast of Greg’s Mine Supply towards Horizon’s Rest, as you see the airplane wreckage on the world map. 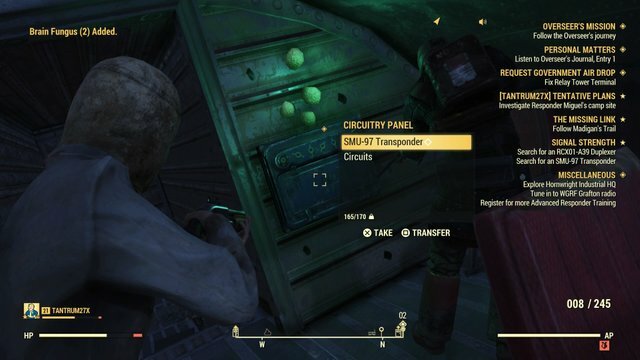 Now, you need to find a tower which guarded by Super Mutants. Battle your way to the top of the cliff, where you will find the wreckage of the plane’s nose, head inside then up to the cockpit where you can find the Transponder in a panel on the wall. 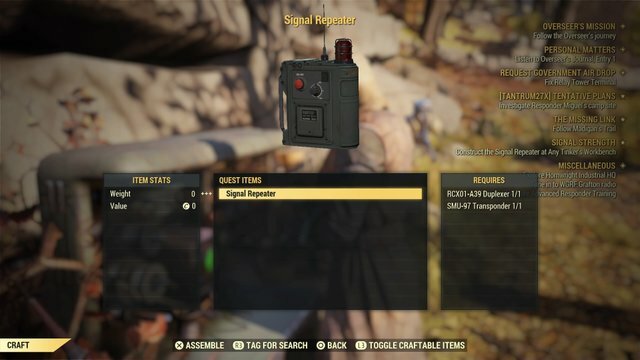 Now with both pieces in your inventory head to any Tinker’s Bench where you can craft the Signal Repeater and open up the next objective. Yes, now you have to start installing the Signal Repeater. 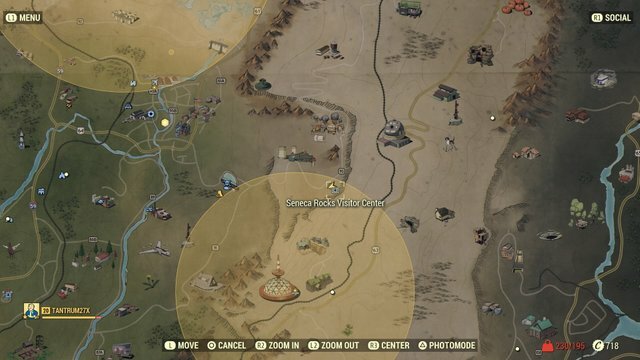 For that, just head to the southeast toward the quest marker to reach National Isolated Radio Array. 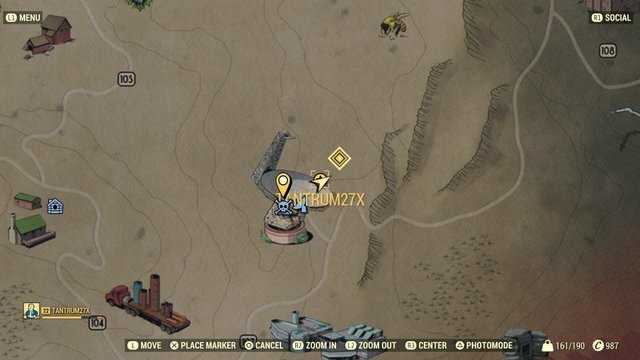 Be very careful, this area is surrounding with Super Mutants when you first arrive, including a chance for a Legendary Super Mutant to spawn. 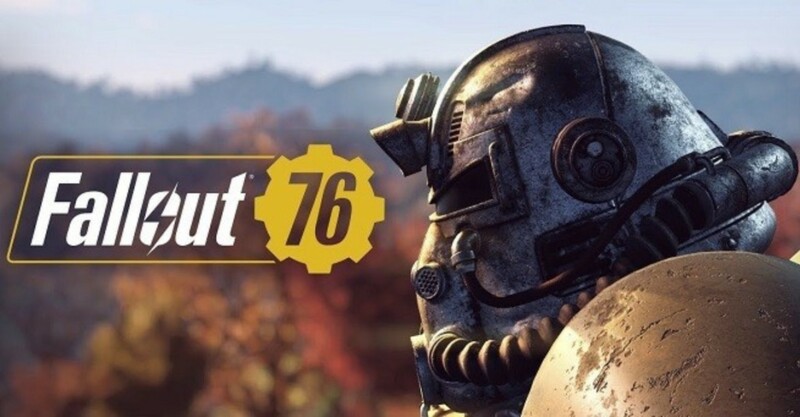 These Super Mutants like to use explosives, and there are plenty of destructible vehicles around making things even more dangerous. 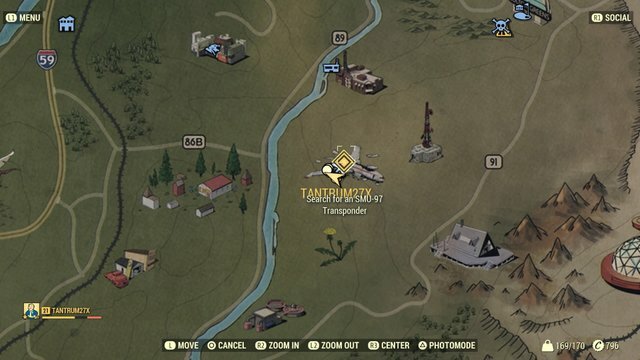 Once the area is clear head slightly northeast of the location marker toward the small radio tower marked with the quest icon. 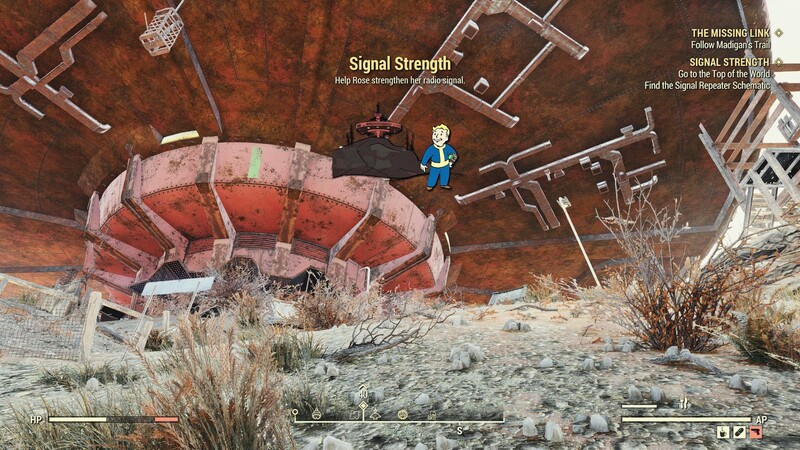 Use the panel at the base of the tower to install the Signal Repeater, and be ready to do battle again with a small group of Protectrons that spawn when you do. 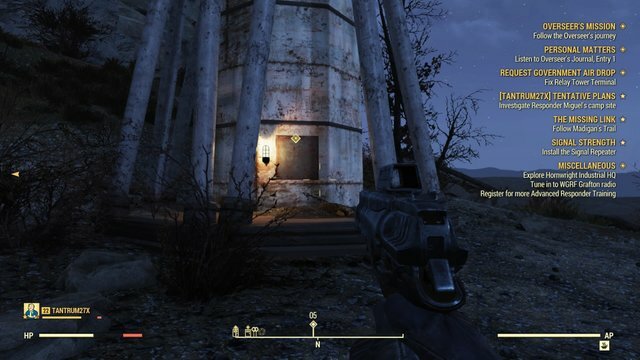 They are much less threatening, so clear them out then follow the quest marker again towards the small maintenance building near the tower. 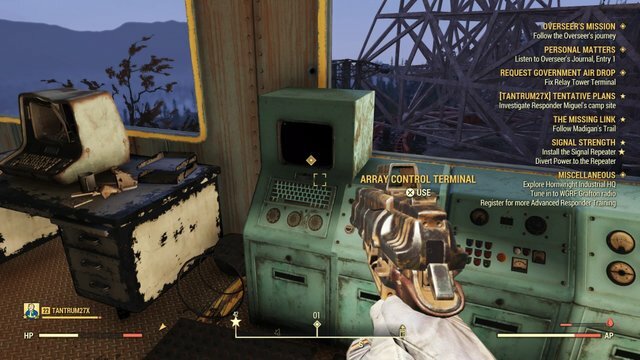 Get into the maintenance building and use the quest marked Array Control Terminal. Once you’re inside the terminal, select “Auxiliary Component Control” then “Divert Power to Auxiliary Component”. This will activate the Signal Repeater and strengthen Rose’s radio range. Speak to her over the airwaves and she will ask you to come visit her at Top of the World. Now walk back to Top of the World, then use the elevator to go up to the third floor into Rose’s office to learn the truth about her identity, as well as the fate of Madigan who you have been searching for as apart of The Missing Link quest. The first sub-quest completed, next, you have to complete the second one, Flavors of Mayhem sub-quest. Good luck!